This is possibly one of my favorite dishes to make. It’s very easy and simple and the only thing that takes some time is the pomegranate. Halloumi (also hellim in Turkish or ḥallūm in Arabic) is a delicious salty Cypriot cheese, usually made from a mixture of sheep and goat’s milk. It can be put to a high heat and get softer, but not melt (think mozzarella balls). It’s a common dish for breakfast but this recipe can be great as a cheese dessert as it’s easy to prep but can be fried in a matter of minutes. Halloumi can be bought at Mediterranean shops and sometimes at food co-ops, Whole Foods or other international stores. If you’re in Bellingham, you can buy it at Mediterranean Specialties, Haggen or other shops found here. It might cost $5-7 for a block, but I find they are usually big enough for 5-6 servings. Pomegranates are a little harder to find, but if all else fails, you could use a pomegranate jam, sauce, juice or try another tart berry, like raspberries. 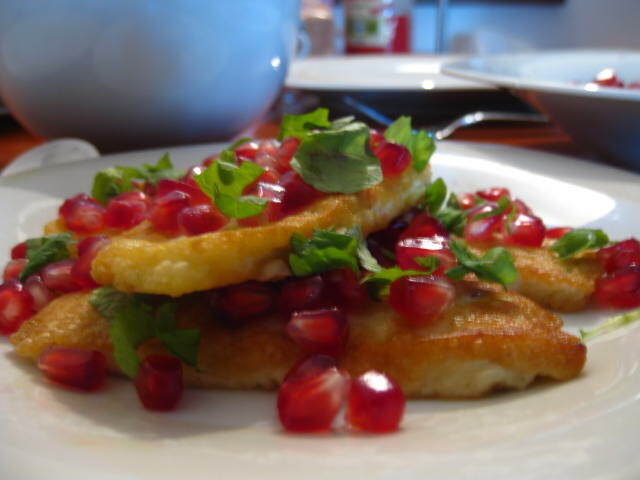 *Put the fried halloumi on a plate, sprinkle with pomegranate seeds and fresh mint and enjoy!